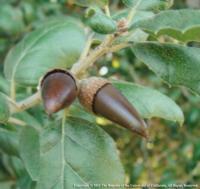 There are over 20 species of native California oaks. Several of these are endemic and grow naturally nowhere outside of California, while others are more wide ranging and grow from Canada to Mexico. There are both shrubby oak species that never grow more than a few feet tall, as well as oaks that attain a tree form. 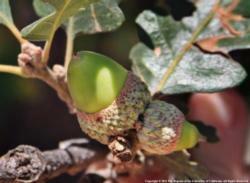 By clicking on the species listed to the right you can view descriptions of eight California tree oak species, including information about what the bark, leaves and acorns look like. There are also pictures and line drawings of each of these species, as well as range distribution maps and other species-specific information. In addition, there are links to information about the values of hardwood rangeland stands and wildlife habitats in oak woodlands.